I been distracted lately from writing new articles, so today I'll do a little catching up. 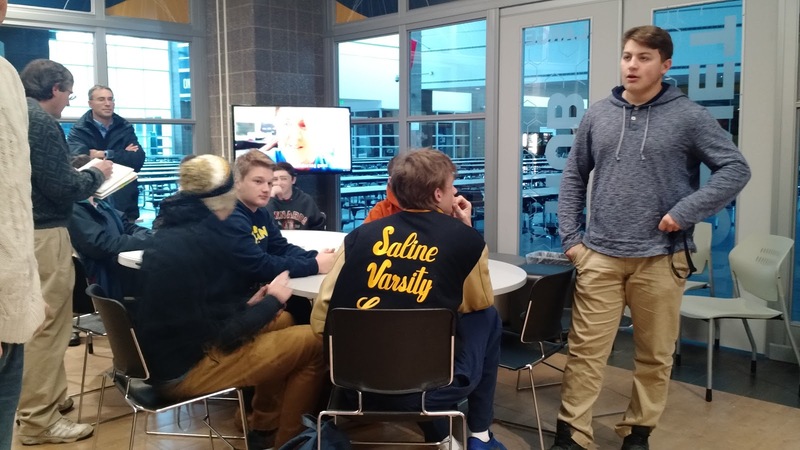 I started a new job AND began mentoring for the Saline Singularity Robotics Programming team for Saline High School, all about the same time. 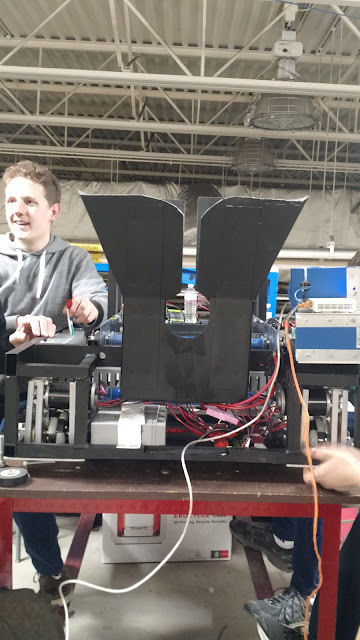 Our six week build cycle ended last Tuesday and now it's time to take a breath. The last Saturday of the build, I brought my camera in for some fun pictures. It didn't take too much coaxing to get these guys out doors on a beautiful sunny day for some team photos. Michael (on the end, left) is the Team Lead. This is the programming team, minus 2 guys. And this .... is their best robot pose. Haha! And finally, the robot. The game released from FRC was themed "SteamPunk" and the game was all about powering and flying an airship. Cool. You have to fill a airship with balls (steam) and put together a rotor. Lastly, the robot has to "fly" by grabbing on to a rope and pulling itself up. Let's rewind a little. Kickoff began like this. 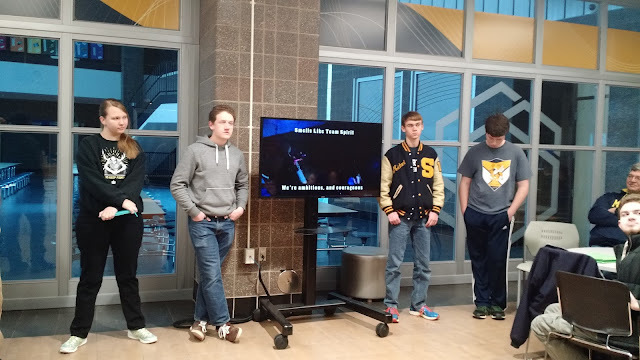 Everyone gathered in the Hornet Hub to socialize and watch the kickoff video from FRC (First Robotics Competition). The room was filled and the excitement was contagious. Then ... the plan was created. Represented here is 4 of the 5 leads for each area.... Business, Electronics, Programming, and Cad. Where the heck is mechanical? Ah, there he is. The guy standing up on the right. It's nice being in a school district that has it's own metals lab. The whole thing was designed and built at Saline High School. So the mentors and students got busy designing and making the robot. And testing it some more. Initially when I was asked to mentor, I thought, "Great!" Sounds like fun! I said, "I've never built a robot, but it would be fun to try." I know a little something about coding, and I was excited. Basically every tool and language was different than what I've used in the past. Some similarities - but new. Great .... (hangs head). Eclipse, Java and Git. Even the scouting app was done with Android studio for the client and a Raspberry Pi web server running Python. Does no one use Microsoft stuff anymore? So we all learned a lot this past six weeks. 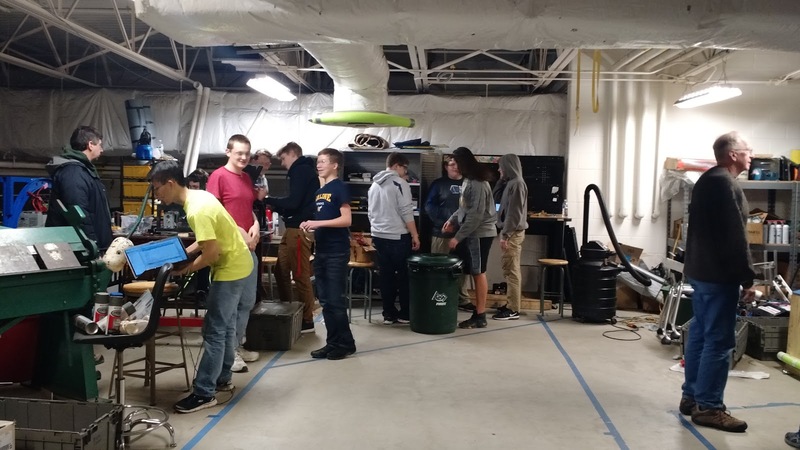 Not only did we program motors and controllers, but we learned about setting up and coding autonomous mode using a vision system and mouse odometry. 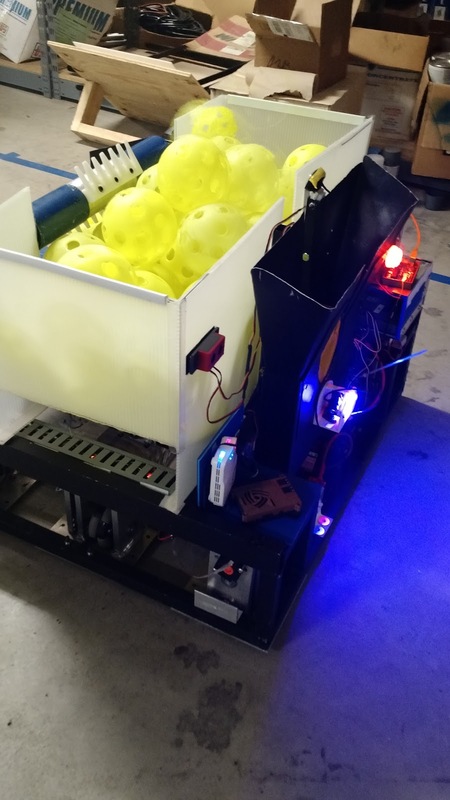 We put together systems for making the robot sense where it is and where it needs to go using USB cameras and 6 wired optic mice. It certainly was the most exhausting and exhilarating time. We met everyday from 5:30-8:30pm, and every Saturday from 10am to 4pm. The technology was so interesting and these nerds ..... well they are the best group of guys to work with. Their parents should be so proud of each and every one of them. I know I am - and so is our school district.